Sunplast Hard Plaster System gives the finest court surface with unique combination of great strength with whiteness. Hard wall plaster system needs no painting or cleaning to restore it back to its pristine state. Minimum life expectancy exceeds any plaster product currently available in the world. These walls are compliant with all specifications and standards defined by the WSF. This system has been tried and tested all over the world. Moreover, it can be used in all kinds of climatic conditions from sub-arctic to desert. Sundek Hard Plaster System has been proved for excellent durability for high impact resistance, flat and true predictable rebound surfaces, superb reflectance, ball visibility and cost effectiveness. 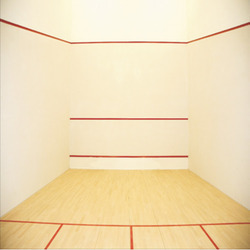 Sundek Sports Systems provide with supply and application of Sunplast cement based Hard Plaster system confirming the requirement of WSF (World Squash Federation) consisting of a Base Coat and a Finish Coat of a total thickness of app.15 mm and coated with imported washable paint system. Due to the extremely hard nature of the plaster a slight uneven color distribution and micro porous surface checks may be seen once the plaster has dried. This does not affect the strength or the integrity of the plaster and is not to be considered as a defect. The dimensions of the court are 9750 X 6400 mm between plaster face: You will provide us with walls in proper plumb, level and at right angles. In order to bring the court to the required dimensions the walls should provide for a plaster thickness of app. 15 mm on each wall.